Prof Stefan Wuchty received one of the three annual College of Arts and Sciences awards for scholarly activity, recognizing his impressive research achievements during the academic year. Computer scientists possess important skills, which go far beyond computation and coding – and which can be applied to numerous areas of interdisciplinary research. Many people can write programs, but a computer scientist can write the next program. In the six years since the department launched its Ph.D. program, its advanced students have engaged in research with applications for healthcare, robotics and beyond – with remarkable potential to change our world. Brian Blake has been named Editor in Chief of IEEE Internet Computing. The IEEE Computer Society is the world's leading computing membership organization. IEEE Internet Computing presents novel content from academic and industry experts on a wide range of topics, including applications, architectures, information management, middleware, policies, security, and standards. The magazine consistently ranks among the top 10, and often in the top 5, for influence and impact of all the computer science/software engineering journals listed in the Thomson Reuters Journal Citation Reports. A team of University of Miami researchers, including Prof Ubbo Visser, is part of a trio of institutions that have been awarded a $20 million grant from the National Institutes of Health to create a Center to integrate and analyze large and diverse datasets of cellular signatures as part of the Big Data to Knowledge (BD2K) initiative. Prof Dilip Sarkar has recently been awarded a patent for a technique that improves WiFi access. Congratulations to our 2014 Champion, Nelson Dellis! 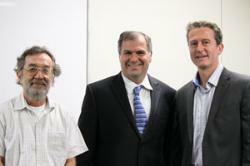 Tony Dottino, Nelson Dellis, Dr. Restak and Marshall Tarley. Ubbo Visser, an associate professor of computer science, demonstrates the autonomous, programmable robots used by his students to compete in international robotics competitions. 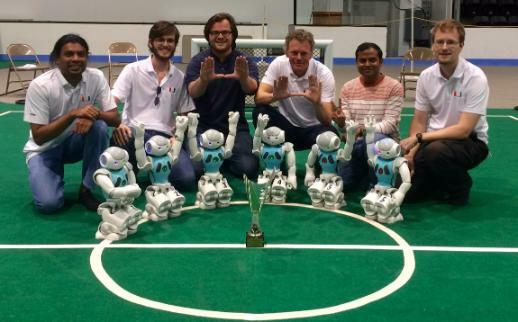 The mechanical humanoid drones of the University of Miami's RoboCanes soccer team were a crowd pleaser on the first day of the eMerge Americas Techweek Expo and Summit in Miami Beach, drawing curious onlookers enamored by all things tech. So, why does someone major in Computer Science? “I wanted to build code that does something,” said alum Al Monserrat, who returned to campus recently to speak to UM students about his experiences creating his own startup and working as SVP of Worldwide Sales and Services at Citrix, an industry leader and multi-national cloud computing company that enables mobile workstyles. At the 2016 College of Arts and Sciences Faculty Scholarly & Creative Activities Recognition Reception, Prof Odelia Schwartz received one of the three Certificates of Excellence for Scholarly & Creative Activities, and Prof Ogihara was awarded a Cooper Fellowship. Congratulations to both! Negin Arhami is the first female PhD graduate from the Department of Computer Science. She defended her thesis "Automated Theorem Proving by Translation to Description Logic" on the 28th October, and is off to a career with Microsoft. See the e-Veritas article. 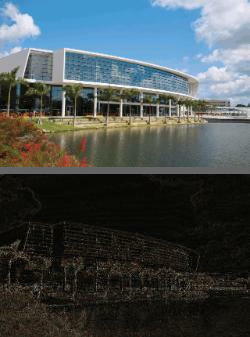 Join us for a networking event with the speakers from our 2nd VizUM Annual Symposium Fernanda Viegas PhD and Martin Wattenberg PhD of Google's "Big Picture" data visualization group, plus UM faculty in STEM fields (Science, Technology, Engineering, and Mathematics). As leaders of Google's "Big Picture" data visualization group , Fernanda and Martin invent new ways for people to understand and explore data. 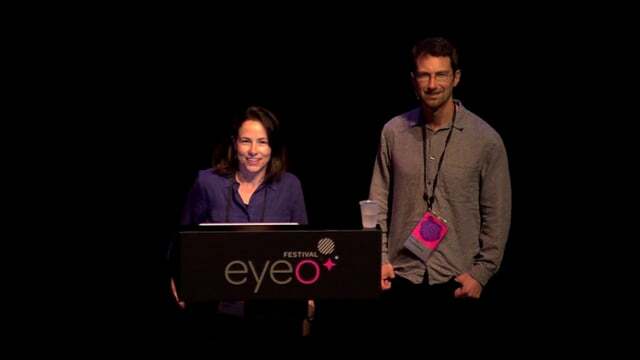 They are well known for their global contributions to social and collaborative visualization, and their visualization artwork has been exhibited at museums worldwide. Lunch will be provided. This event is open to University of Miami students only. This event is sponsored by the Department of Computer Science, the Center for Computational Science, and the Women and Gender Studies Program of the College of Arts & Sciences. Did you know that in 2013, just 26 percent of computing jobs in the United States were held by women? Several panelists from academia and industry have been invited to the University of Miami (UM) to discuss the challenges facing women in tech careers today, and how we can work together to resolve those challenges. More information here. 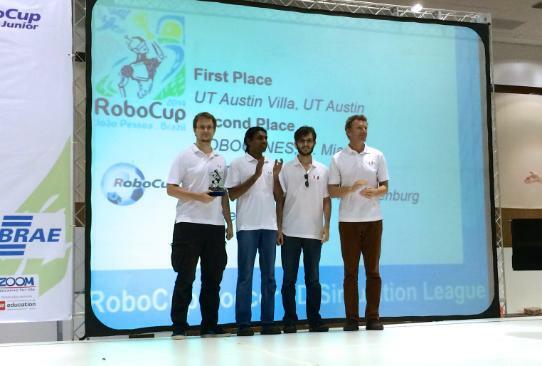 The Dpartment of Computer Science's autonomous soccer playing robot team "RoboCanes" won the RoboCup US Open 2015 competition yesterday. The US Open are the American Championships and one of the three big events prior to the World Championships that take place in Hefei, China in July this year.